The purpose of this chapter is to overview elements of the theory of stochastic differential equations, based on Wiener processes, for use in the subsequent chapters. This theory was founded by K. Itô in 1942 (Itô, Zenkoku Shijo Sugaku Danwakai 244:1352–1400, 1942; Itô, On stochastic differential equations. Memoirs of the American Mathematical Society, vol 4. AMS, New York City, 1951). His aim was to construct Markov processes, governed by Kolmogorov’s differential equations via Wiener processes, and to analyze their sample paths. After that, stochastic differential equations have been used to describe dynamical processes in random environments of various fields. 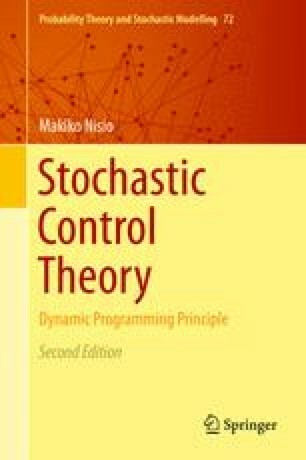 Here we consider stochastic differential equations with random coefficients, because we aim at studying stochastic control problems.The chapter is organized as follows. Section 1.1 is preliminaries. The basic definitions and results on stochastic processes are collected for later use. Stochastic differential equations and stochastic analysis will be introduced in Sect. 1.2. Section 1.3 deals with asset pricing problems as an application of previous results.